Okay. What follows does not mean much. This is mostly for fun. If you play around in our stats pages, either in the Signature Stats or Fantasy Stats (all available to subscribers! ), you’ll notice that most of our stats default to either a 50 or 25 percent qualifying rate. Exactly what a “qualifying” rate is depends on the position or the stat, but in general, it means that percentage of the league leader. So if the league leader at wide receiver had 200 targets, our stats at 25 percent would default to everybody with 50-plus. You can of course adjust these percentages. Our options include 25, 50, 60, and 75 percent (the last of which, I assume, is just for those out there who want to limit their field to the top, say, two people in a stat — 75 percent is an option I’ve literally never used). And on the flip side, is the choice of [ALL], yielding results that show you every player who played that position. It’s helpful for seeing that the only perfect passer ratings of 2017 were achieved by Mohamed Sanu and Pat O’Donnell, but less helpful for divining meaning from something like that — that doesn’t mean Sanu was the best passer of 2017, obviously. Still, it can be fun. For example, LaMichael James (or “LaMike,” apparently) played for two teams in 2014, spending time with San Francisco early in the year, getting released, and joining the Dolphins’ active roster in September. With our stats page differentiating players by team played for, James gets listed twice in our 2014 stats page. And the end result is that James had the single highest elusive rating (133.3) for any running back in 2014 and also tied for the lowest (0.0). That’s interesting. Is it less interesting when you realize that those stats came on a combined five carries across the two teams? I mean, maybe a little, to you. I still find it interesting. I just don’t try to divine meaning at that point. Cohen’s a running back. You knew that. You probably knew he had a pair of pass attempts as a rookie. In Week 6, he threw a 21-yard touchdown pass to Zach Miller. In Week 17, he had an incompletion. What you probably don’t know is that his 21-yard touchdown pass included nothing after the catch for Miller — in fact, he caught the ball eight yards deep in the end zone, meaning Cohen had 29 yards in the air on his 21 passing yards, 138.1 percent of his passing yards came in the air. He’s the only passer to top 100 percent on this list, though Jon Ryan and Joe Webb both had exactly 100 percent on their limited attempts. Jameis Winston actually led the league in this number among quarterbacks with at least 200 attempts, at 65.1 percent. Mike Evans’ limited after-the-catch numbers are well-documented at this point (only four qualified receivers — Breshad Perriman, Andre Holmes, Corey Coleman, and Dontrelle Inman — had a lower average than Evans’ 1.6 yards), and that combined with DeSean Jackson’s down year meant Winston didn’t get nearly as much help from his receivers after the catch as other quarterbacks. Rush is actually a quarterback! He barely played as a 2017 rookie, with three pass attempts across two games played. He only had one completion, for two yards to Ryan Switzer in Week 7. Of course, the pass was targeted 4 yards shy of the line of scrimmage, which means Switzer took the ball six yards to gain his two, which means Rush ended the season with 2 passing yards on -4 yards in the air. Even if there’s no meaning to it, you never really want a negative number on your stat sheet at the end of the year. Technically, Sanu won this one, with one 51-yard touchdown as his full season of stats yielding a perfect 158.3 passer rating, but Bradford is actually a quarterback, and on seven deep attempts on his shortened season, Bradford completed five of them for 130 yards and a touchdown, good for a 153.3 passer rating. Considering Bradford had a 121.5 deep-ball passer rating in a full 2016 season, that wasn’t exactly a fluke (though obviously 153.3 isn’t sustainable). 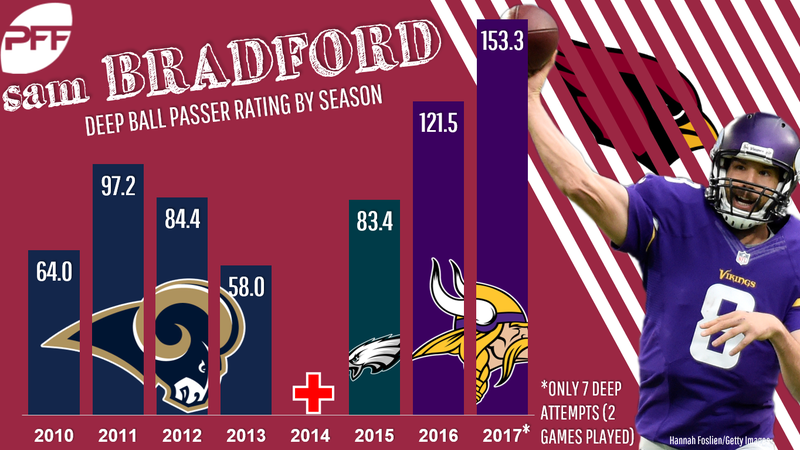 Bradford’s time in Minnesota was short, but he did well while he was there. Will that carry over to Arizona? Well, his 121.5 in 2016 marked a career-best by a wide margin, so the Minnesota coaching staff and/or the Stefon Diggs/Adam Thielen combo worked wonders for Bradford. Let’s not count on the 121.5 (let alone the 153.3) being his new normal. Elusive rating is our measure of a runner’s success beyond what his blockers do for him, incorporating forced missed tackles and yards after contact. On five carries in 2017, Dayes, the Cleveland rookie, forced three missed tackles and had 3.40 yards after contact per rush. That’s fine. Nobody is going to look back on his rookie year as a resounding success because of nine total touches for 42 total yards. The interesting thing here for me is second place. Because while it’s not that remarkable to lead the league in forced missed tackles per carry on just a few carries — one good run and you’ll rule the statistic — it’s way more impressive to be in second place on 201 total touches. And — not that you need the information — that’s part of what made Alvin Kamara’s rookie year so impressive. Dayes needed a small sample to lead the league at 113.3. Kamara had a massive workload and just barely missed Dayes’ total, at 108.5. Edmunds played all 16 games as a rookie for the Saints but had a total of nine carries in that time. Across eight of those carries, he totaled 7 rushing yards. But on the eighth, he broke free, going for 41 yards. That gave him 48 rushing yards on 9 carries — a perfectly respectable 5.3-yard average — but with 85.4 percent of those yards coming on a single carry. Seven running backs had a breakaway percentage (percentage of yards gained on runs of 15-plus yards) of 50 percent or higher. Of those seven, six had 16 or fewer carries. The seventh was Cohen, who had 186 of his 370 rushing yards come on his seven breakaway runs, showing his explosive ability as a rookie. If he can maintain his general efficiency in 2018 and bring in the increased workload we’ve heard rumors of, Cohen could prove to be the Tyreek Hill-esque weapon we’ve heard about him becoming. Wilson saw one target as a rookie and caught it for an 18-yard touchdown, yielding the season’s only perfect WR rating (the passer rating a player generates when targeted) of 158.3. That was followed by Jaelen Strong (143.8 on four targets) and Maurice Harris (140.3 on six) before getting to a player with a sample size that actually matters. JuJu Smith-Schuster finished fourth in WR rating at any sample size, generating a 134.0 across 77 targets. Smith-Schuster entered 2017 without much fanfare, expected to be at best fourth or fifth on the Steelers’ target pecking order (behind Antonio Brown, Martavis Bryant, Le’Veon Bell, and maybe one of the tight ends). He surpassed Bryant in short order and ended the year as an easy WR2 in fantasy. Hamilton, the ex-Steeler, had six targets with the Texans last year, catching only one for 8 yards and also seeing one intercepted. It was just barely worse than Harry Douglas, who had the exact same results as Hamilton, but on only 3 targets. 15 players had WR ratings lower than the throw-the-ball-into-the-ground-on-every-play baseline of 39.6. Only three of those had more than 22 targets: Eli Rogers (38.3), Kamar Aiken (27.6), and Breshad Perriman (14.6). For Perriman, that now gives him a WR rating of 49.3 across his three-year career, which … well, there’s a reason the Ravens signed three receivers out of free agency and drafted two more. Robinson ran one route in 2017. He was targeted on that route. He caught that target. He went for 17 yards. That’s good! He was injured on the play, tore his ACL, and didn’t play again in 2017. That’s less good. Robinson now has a four-year YPRR average of 1.73, including 2.17 in his breakout 2015. Now on the Bears, Robinson should be the No. 1 receiver in an ascending offense, and is the No. 16 WR in our consensus PPR rankings. Only five receivers had YPRR averages of at least 3.00 in 2017. Four of them (Robinson, Jamal Agnew — a cornerback who ran five routes and caught two passes — Freddie Martino, and Bobo Wilson) had a combined 10 targets and can easily be discounted. The fifth was (who else) Julio Jones, who turned a sixth-in-the-league total of 143 targets into a second-best total of 1,444 yards on 469 routes, good for 3.08 YPRR, his third straight year topped 3.00 — all other qualified receivers combined have done that zero times in that same span. If Jones can just have a little better touchdown luck in 2018, he’s a strong candidate to finish as the WR1.